Immunotherapy: The next best hope for defeating cancer? Whether you’re treating something as deadly as cancer or as frustrating as chronic allergies, immunotherapy offers the possibility of slowing or reversing disease. Veterinary researchers have attempted for decades to harness the power of the immune system to fight cancer. Given the challenges presented by cancer in its various forms, many experts believe that immunotherapy eventually may be the game changer. “I think it’s the next best hope we’ve got,” said Rowan J. Milner, BVSc, MVetMed, Ph.D., Dipl. ACVIM (oncology), the Hill’s professor of oncology at the University of Florida College of Veterinary Medicine. For cancer, immunotherapy is just one component of multi-modal treatment. According to Dr. Skorupski, melanoma—in both people and dogs—is a known immunogenic cancer and, in both species, spontaneous remissions are sometimes seen. It’s theorized that these remissions are a result of the patient’s immune response to the cancer. However, immunotherapy is no panacea; clinical response is highly variable. “In many cases, a subset of patients show remarkable clinical responses while others may not achieve the same benefit,” said Nicola J. Mason, an associate professor of medicine and pathobiology at the University of Pennsylvania School of Veterinary Medicine. A lot remains to be discovered about how immunotherapies can work together with conventional cancer treatments, Mason said. The vaccines in both studies are similar. “In the case of the melanoma study, we do surgery on some of them and then we vaccinated them, and they are not allowed to get anything that would suppress their immunity [such as cortisone],” Milner said. More than 500 dogs have been enrolled in that trial. The results will be published as soon as the intellectual property rights have been secured. “The osteosarcoma vaccine trial is different because we are administering the immunotherapy while we are giving chemotherapy,” Milner said. “Our hypothesis is that by vaccinating them during the time they are getting chemotherapy could have a beneficial effect by decreasing cells from the bone marrow, called myeloid derived suppressor cells.” Because these cells are thought to play a crucial role in suppressing the immune system at the site of the cancer, reducing them with platinum-based chemotherapy could be beneficial. In addition, an interesting phenomenon has been observed with some osteosarcoma dogs that have a surgical limb-sparing procedure and receive a prosthesis. It has been reported that dogs that develop infections at the surgical site live longer than dogs that don’t get such infections. 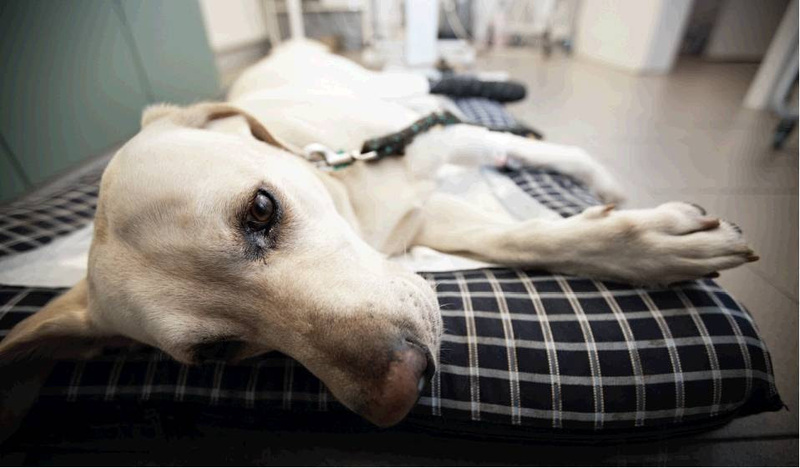 The UF research team also is studying the effect of chimeric antigen receptor T-cell therapy, a targeted form of immunotherapy, on osteosarcoma in dogs. Whereas the vaccine is designed to be given concurrently with chemotherapy, the CAR T-cells can be administered only after chemo is finished. According to Milner, CAR T-cell therapy is mainly being used for bone marrow cancers in humans, although some research is being done with sarcomas and brain tumors. “You harvest T-cells from a patient and then with a viral vector you introduce a virus with a piece of encoded DNA called a plasmid that is carried by the virus into the T-cells,” Milner said. “Then these T-cells will make an antibody against the ganglioside target like GD3 or GD2. This form of immunotherapy carries risks, and Milner said more research is needed. Although the symptoms of allergic disease can be mitigated with various treatments, many long-term symptomatic patients won’t achieve lasting resolution without immunotherapy. “At this point, allergen- specific immunotherapy is the only treatment that can alter the course of the disease,” said Rosanna Marsella, DVM, Dipl. ACVD, a professor in UF’s department of small animal clinical sciences. “[With] all other treatments, the moment you stop them you are right back to where you were. Marsella said there have been no reported anaphylactic reactions with the sublingual route of administration. However, clients have no problem administering the vaccine daily at home, and patients like the sweet taste. The real upside to the sublingual vaccine is cost. One message Marsella wants to convey is the importance of referring to a dermatologist early. Immunotherapy is a promising tool to fight a number of diseases, but it’s not without risk. “The immune system is incredibly powerful, and it can be very damaging,” Penn Vet’s Mason said. Creating a cytokine storm. The immune system produces large amounts of cytokines, which lead to significant morbidity and even mortality. On-target but off-tumor cytotoxicity caused by the targeted antigen expressing on other tissue types. With more research, immunotherapy might be the key to beating back cancer and other diseases once and for all. “Harnessing the tremendous power of the immune system to kill abnormal cells represents a more specific, effective and lasting way to eliminate disease than most of our current therapies,” Mason said. Torigren Pharmaceuticals of Farmington, Conn., introduced VetiVax, a tumor-derived immunotherapy treatment for cancer, in August. Tumor material must be shipped on ice, in saline and not fixed in formalin. VetiVax is administered by a veterinarian via subcutaneous injection once a week for three weeks. T-Cyte Therapeutics Inc. launched Lymphocyte T-Cell Immunomodulator (LTCI) in October. The Murrieta, Calif., company described LTCI as the first U.S. Department of Agriculture-approved treatment for osteoarthritis in dogs. LTCI is administered via subcutaneous injection and acts as an immunomodulator, increasing the number and function of precursors of a regulatory T-cell population. As a result, the immune-mediated response is reduced. T-Cyte reported that LTCI is a safe treatment option for dogs that cannot use NSAIDs, including patients with kidney, liver or heart issues; senior dogs; and those that cannot tolerate the side effects of NSAIDs. Chagrin Falls Pet Clinic in Chagrin Falls, Ohio, is the first and only U.S. animal hospital taking part in a clinical trial investigating synchronization immunotherapy to treat cancer in dogs. Carol Osborne, DVM, is working in conjunction with Biotempus Ltd. of Melbourne, Australia. Milner RJ, Chimura N, Bowles KD, Salute M. “Abstract A29: Differential Expression of the Gangliosides GD3 And GD2 in Canine and Human Osteosarcoma Cell Lines: An Immunotherapy Target” Cancer Immunology Research. 2015 October 01; 3(10 Supplement):A29-A29. Chulanetra M, Sayour E, Eldjerou L, Lagmay J, Slayton W, Chang L, Milner RJ. “Abstract 3157: Novel GD2-Specific Chimeric Antigen Receptor-Modified T-Cells Targeting Osteosarcoma” Cancer Research. 2015 August 01; 75(15 Supplement):3157-3157. Milner RJ, Salute M, Crawford C, Abbot JR, Farese J. “The Immune Response to Disialoganglioside GD3 Vaccination in Normal Dogs: A Melanoma Surface Antigen Vaccine” Vet Immunol Immunopathol. 2006 Dec 15; 114(3-4):273-84. PubMed PMID: 17027091. Rowan J. Milner, James P. Farese, Marc E. Salute and Nick Bacon, et al. 2010. “The Immune Response to Disialoganglioside GD3 Vaccination in Dogs With Spontaneous Occurring Melanoma: A Large Animal Translational Model” Proceeding American Association for Cancer Research, Tumor Immunology: Basic and Clinical Advances, November 30-December 3, 2010, Miami Beach, Fla.
Marsella R, Ahrens K. “Investigations on the Effects of Sublingual Immunotherapy on Clinical Signs and Immunological Parameters Using a Canine Model of Atopic Dermatitis: A Double-Blinded, Randomized, Controlled Study (abstract)” Vet Dermatol 2012; 23(Suppl 1):66. Originally published in the November 2016 issue of Veterinary Practice News. Did you enjoy this article? Then subscribe today!